At an average inspection I will be onsite for 3 hours. I strongly encourage you to accompany me so that you may ask questions and gain a better understanding of the systems in the home. This also affords the opportunity to discuss the findings in person and answer any questions you may have. Following the inspection, the findings will be compiled into an easy to-read report, which will include detailed descriptions and digital photos of any issues discovered. You will be emailed the link to view your report the same day. The completed report will be accessible anytime, anywhere, via the internet for a period of 5 years. The report can be viewed, printed and forwarded with ease. With your permission we will send a copy to your realtor as well. 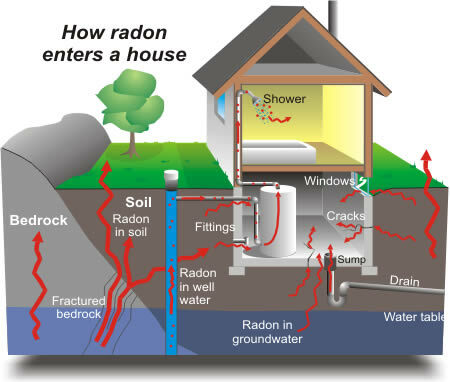 EPA AND THE SURGEON GENERAL RECOMMENDS THAT ALL HOMES BE TESTED FOR RADON! Radon is a colorless, odorless and tasteless radioactive gas created from natural deposits of uranium and radium in the soil. Radon gas gets trapped inside homes and becomes a health risk to those living in the house. Radon can be found in old or new homes built on all types of foundations (with or without basements). Why is it a health risk? Radon is a nationwide problem. The EPA and the Surgeon General have determined that Radon is the #1 leading “naturally occurring” cause of lung cancer and is only second to cigarette smoking in its death toll. 21,000 deaths per year…that’s over 50 people per day! The Ohio Department of Health estimates that about one in three (1/3) Ohio homes have enough radon to pose a SIGNIFICANT risk to the occupants health over many years of exposure. Radon can be drawn into your home and accumulates to concentrations that increase your family’s risk of contracting lung cancer. Elevated levels of Radon have been found in increasing numbers in this region. The numbers don’t lie…over 20,000 lung cancer related deaths are caused each year by Radon. Although radon is present throughout the environment, radon levels (indoors), are generally higher, which increases the risk of cancer. Radon can enter a home through floors and walls—anywhere there is an opening between the home and the soil. Examples of such openings include dirt floor crawlspaces, unsealed sumps, cracks in slab-on-grade floors, utility penetrations, and the tiny pore spaces in concrete block walls. A basement, of course, provides a large surface area that contacts soil material. When you hire Royal Home Inspections, your test will be conducted using a continuous radon monitor which is calibrated by Radalink for accuracy. The main benefit of having the home tested using a Radalink continuous radon monitor is that we are able to see radon levels, temperature, and humidity for each hour the testing unit is in the home. This and other features ensure the monitor was not tampered with during testing. An overall average is then calculated as your average indoor radon level. The EPA recommends mitigation if the radon level is 4 picoCuries per liter (pCi/L) or higher. What is the role of the real estate professional regarding radon? Real estate professionals address many aspects of buying and selling homes. However, their licensing and the Ohio Radon Law, prohibits Realtors from offering technical advice regarding radon and health risks, unless they are licensed radon specialists. Instead, they should advise their clients to consult with the Ohio Department of Health or a licensed Radon tester like Royal Home Inspections. I will inspect for visual mold. You usually do NOT need to spend money on determining the type of Mold. Plain and simple: You need to remove it. All mold must be removed and done so in the same way (as described in the next bullet point), regardless of the type of mold. If a so-called mold professional insists that you need to spend hundreds of dollars on testing when mold is already visible, our advice is to be very wary because its simply a waste of money except in the rarest of circumstances. Safety – Protect all workers and occupants. Assessment – Make a preliminary assessment, an assessment during mold remediation and an assessment after mold remediation. Contamination Control – Prevent cross-contamination and the spread of mold from contaminated areas to areas absent of or with less contamination. Source Removal – Physically remove the mold at its source. Moisture Removal – Eliminate the moisture problem that caused the mold outbreak. Ninety-five percent of the time your mortgage lender will require that a wood destroying insect inspection is completed on the property you wish to purchase prior to settlement. 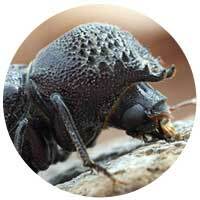 This will insure that it does not have an active infestation or major structural damage from wood destroying insects. The following insects are classified as wood destroying insects in Ohio: Termites, carpenter ants, carpenter bees, and powderpost beetles. According to Termite Infestation Probability Zones (TIP Zones), Ohio is located in TIP Zone #2 (moderate to heavy), which means the potential for termite damage is considered significant. A complete termite inspection consists of an interior and exterior check of the home. The exterior inspection consists of the inspector probing the attached wood trim, posts, and framing members that are on or close to the ground. Probing garage doorframes, basement or lower-level window frames, step stringers, deck posts, and the entry-door riser. The interior inspection consists of checking wall surfaces, ceilings, floors, baseboards and wood trim. I will be looking for termite shelter tubes and/or damage to sill plates, headers, and joists below grade or adjacent to a dirt-filled, cement-covered patios. Termite activity is of concern only when it is found in the house or in an attached structure such as a garage or deck. If you find termite damage or shelter tubes on wood debris on a fence post in the yard or in a piece of wood debris on the ground in the yard, all that means is that those pieces of wood have had termite infestation. It does not mean that the house is infested with termites and should be treated. 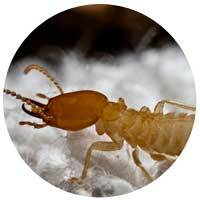 If an active termite infestation is found, chemical treatment by a professional is necessary. When inspecting a house for carpenter ants, I will look specifically at sections of wood that have begun to decay as result of a past or current moisture condition. Typical locations to inspect are portions of the wood framing, siding, or trim that are in contact with the ground; wood that has been dampened by the overflow from defective roof gutters; the area around a damaged section of siding or flashing; the base of hollow porch posts and column, and areas with large open joints as might occasionally be found around exterior windows and doors. These areas should be probed with a screwdriver or an ice pick. If the wood yields, breaks, or cracks and ants come crawling out, there is a good chance that the nest has been located. If the nest is found, it can be treated directly with insecticide. 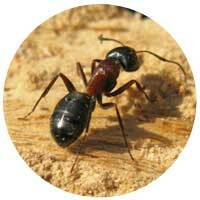 If not, dusts or sprays can be used where the ants are commonly seen. The latter might not eliminate the infestation, but it should reduce it. Carpenter bees make nests by tunneling into wood, vibrating their bodies as they rasp their mandibles against the wood, each nest having a single entrance which may have many adjacent tunnels. 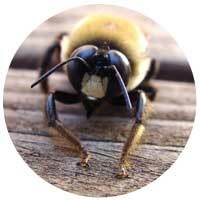 Carpenter bees do not eat wood. They discard the bits of wood, or re-use particles to build partitions between cells. The tunnel functions as a nursery for brood and the pollen/nectar upon which the brood subsists. Carpenter bee infestations are easily identified by the presence of their entrance holes in wood, the presence of sawdust on the ground under where the hole is drilled, the presence of a yellowish combination of pollen and bee excrement near the entrance hole and their bothersome flight activity, especially by the males who are protective of their territory, but do not sting. Inspection for powder post beetles will be performed along with the inspection for termites. When probing the exposed wood-framing members, I will look for the small round and oval emergence holes of the beetles. Since the beetles must emerge from these holes, the fact that there are emergence holes does not mean that the wood member is currently infested. Newly formed flight holes are light and clean in appearance, as a fresh saw cut; older holes are darker in color. Wood members that are no longer beetle infested will still have small amounts of larvae’s frass continue to sift through the holes for many years as result of normal vibrations of the wood. An active infestation in a single wood framing member can often be controlled by replacing that piece of wood or coating it with an appropriate insecticide. However, if an active infestation is widespread, chemical treatment by a professional is necessary. 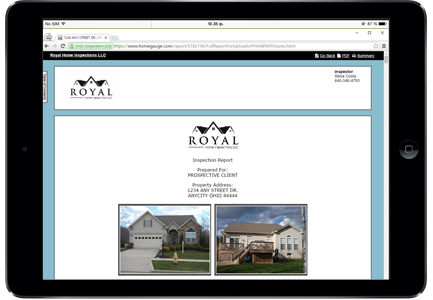 View a Sample Report to see what you can expect!